Welcome to Top Gun Cattle Co.Thank you for taking time to visit our website. We live in South central Nebraska and raise Angus and SimAngus Cattle. We began our Angus journey about 17 years ago. Todd came from a Hereford seedstock operation, and Tricia came from an Angus business. So what do you get? Yep, you guessed it – an F1 cross! We still have a commercial cowherd along with our Seedstock business and you will see many of those F1 crosses roaming the pastures, but our roots fall on the Angus breed. Todd’s work on the rail helped us choose our way. We love Angus Cattle and know that they will be the foundation of the commercial cow/calf industry. About seven years ago, we added another facet to our program. Todd has studied and looked at carcass data for many years and we knew that raising some SimAngus offspring was going to be a valuable addition to our cowherd. The data proves that they are the best cross out there. We understand that heterosis can be a valuable and powerful tool that contributes to the profitability of our customers. Our SimAngus program is relatively limited in size, but will continue to grow. 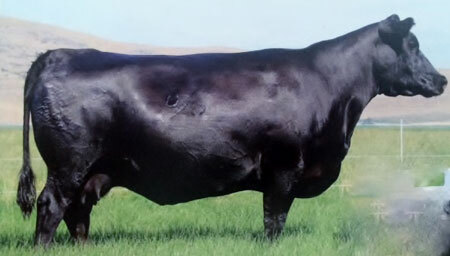 The American Angus Association and The American Simmental Association have the two largest databases in the world, with the most animals and traits evaluated. Angus excels in Calving Ease, low birth weights, post weaning gain and carcass merit. Simmentals share a nearly identical status. These cattle will become a valuable tool to you in hitting industry targets and increasing efficiency.It’s a great time to be a cattleman. Thanks for looking!